CONSTRUCTION of the fort began in May of 1879 and was mostly completed by 1881. However, like most military forts even today, construction and upgrading was continuous through about 1905. SITTING BULL was captured in 1881, but not at Fort Assinniboine. This is only significant in that Sitting Bull’s presence in Canada was a primary reason for the Fort’s construction. IN 1885 THE REIL REBELLION led to increased problems with refugee Canadian Cree Indians who fearing possible arrest and execution by the Canadian Government flooded across the border, spreading out into Montana. This created continual problems during the life of the fort as the troops were called on to round up and relocate the Cree back across the border. During the years of 1887-1888 dozens of skirmishes with the Cree were reported. 1892 THE FIRST TWO COMPANIES of Black 10th Calvary were assigned to Fort Assinniboine. The whole regiment was assigned to the fort after the close of Fort Custer. Eventually companies of the 24th and 25th Black Infantry would also be assigned to the fort making Assinniboine predominantly an all Black fort. In 1895 FIRST LT. JOHN J. PERSHING arrived and was placed in charge of a company of Black 10th Calvary troops. He gained a good reputation working well with the Buffalo Soldiers, carrying out one of the largest round ups of nearly 600 Cree and relocating them to Canada. Pershing eventually rose through the ranks to become the highest ranking general in American History with the equivalent rank of six stars. He was also appointed the commander of all American Expeditionary Forces in Europe during WW I. 1898 THE SPANISH AMERICAN WAR broke out. Black troops at Fort Assinniboine were immediately put on trains and shipped to Georgia and Florida to train for the invasion of Cuba. At the time it was believed that Black troops were immune to certain tropical diseases making Black troops extremely valuable. IN MAY 1898 CHAPLAIN WILLIAM T. ANDERSON became the commander of Fort Assinniboine. Anderson was the first Black officer to ever command an American military fort/post. His command only lasted through May and June, at which time the white Major J. M. Kelley took over command. Only 19 troops remained on the post after the start of the war. LATE 1902 FORT ASSINNIBOINE reached its highest number of troops at 843. Major expansion and rebuilding of many of the forts structures began at this time as barracks and other facilities were remodeled and expanded. IN 1911 A FIRE that destroyed the hot water tower prompting the military to close Fort Assinniboine. 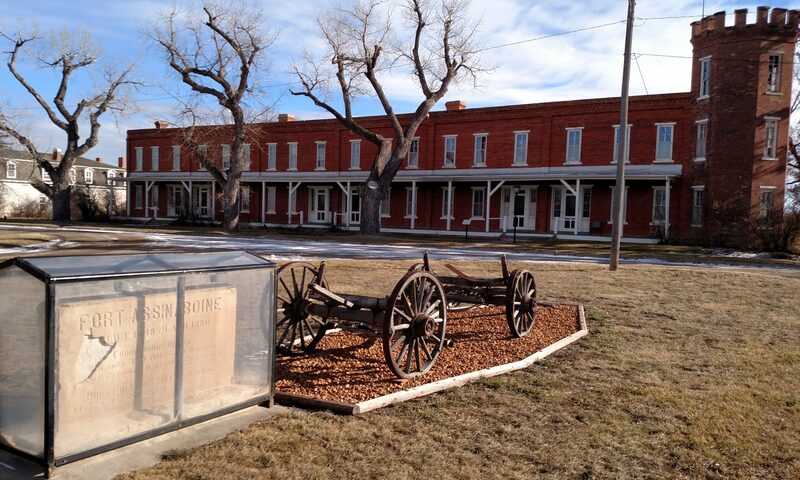 FORT ASSINNIBOINE, the largest military post constructed in Montana, was established in 1879. Within four years, a stately, impressive complex of some one hundred brick, stone, and wood buildings was clustered around the parade ground. Overlooking the quiet meandering of Beaver Creek, and in the shadow of the Bear Paw Mountains the fort buildings were surrounded by a vast military reservation of 700,000 acres. The Fort was designed to house ten companies of soldiers, both infantry and cavalry. The troopers were in charge of monitoring the activities of the many Indian groups living in the region, as well as protecting them and the citizens of Montana from invasions by Canadian tribal bands. 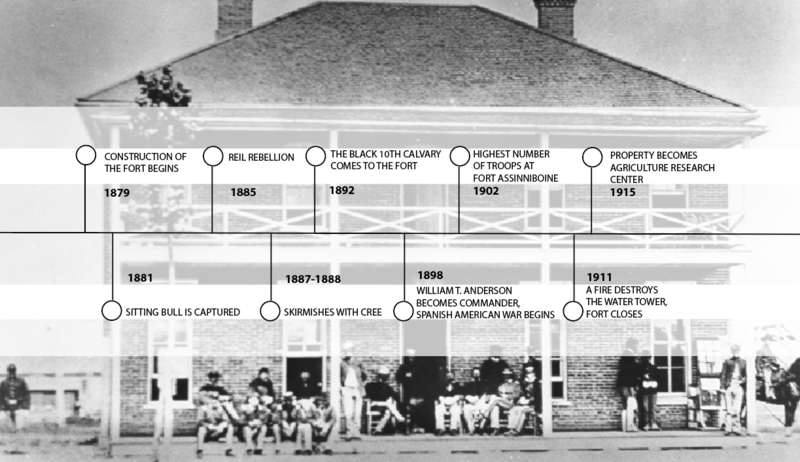 In its hay day, nearly 1,000 officers, enlisted men, and civillians called Assinniboine home. 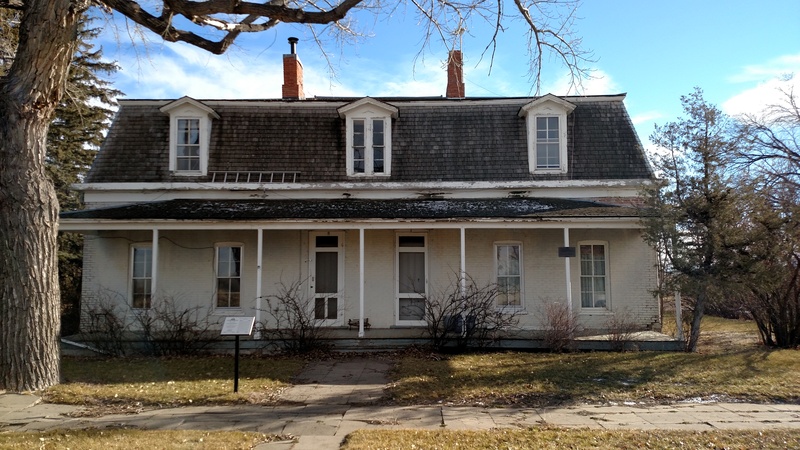 THE FORT, one of northern Montana’s earliest outposts, was a busy self contained city. Bakery, laundry, a barbershop and blacksmith facilities were in operation, as were a general store, post office, hotel, and restaurant. For recreation, the post band gave regular concerts, and the men engaged in such sport activities as baseball, track, and boxing. Other diversions offered included a library for reading, card playing, and checkers, plus an enlisted men’s amusement center housed in the regimental band barracks. The lifestyle was routine, with the men largely spared from battle activity. BY THE EARLY 20TH CENTURY, Montana’s frontier was drawing to a close, and the fort was surrounded by homesteads and the trappings of “Civilization”. 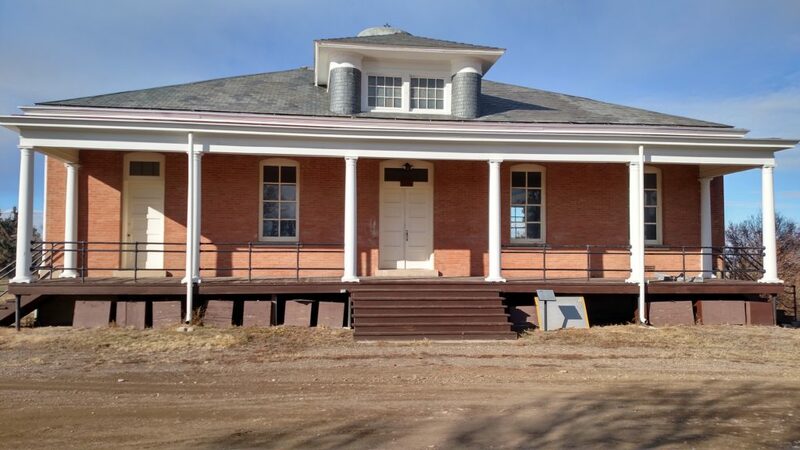 The post was finally closed in 1911, and the state of Montana turned the site into an agricultural experiment station, ran by Montana State University. Today much of the fort is gone, but the surviving buildings are a proud and majestic reminder of Montana’s frontier heritage.